A few weeks ago, I received an email with a suggested reading list ahead of the annual conference in Seattle and one book on the list caught my attention – The Checklist Manifesto by Atul Gawande. It caught my eye for a number of reasons. I work with checklists on a daily basis whether I’m planning, developing or delivering CLE programs. In my pre-CLE life, I worked in licensing exam management. There is no doubt in my mind that without checklists, the licensing exam management process would not run flawlessly with no errors. Having been through licensing processes in the financial services and legal service industries, I know that there is no room for errors at any stage in the process. Version management and seat assignment are integral to maintain the integrity of the process. From room set-up to break scheduling to catering requirements, a checklist is required. In CLE, the same principles apply. In planning and developing a program, there are numerous steps involved that cannot be missed in order to ensure a successful program. There are also a number of people who are involved in the process, in addition to the faculty, so success would not be possible without a checklist. On the delivery side, from room set-up, to catering, to communications with attendees (prior to/during a program), all aspects depend upon and require a checklist. Although Gawande’s research is mainly in the healthcare field, he looks at other industries, including aviation and construction, in relation to checklists. It is clear from his research that checklists make a difference and they work, regardless of the industry. Checklists reduce the probability for human error. Checklists act as a guide to all steps that need to be completed. In aviation, not only do pilots have a checklist of procedures that need to be followed before a flight departs, but they also have a checklist of procedures to follow in the event of an emergency while in-flight. In medicine, particularly in performing surgeries, there is a team working on one patient; however, there are a number of procedures for each of those team members to follow. In construction, each step in building a structure is critical to the subsequent step and there is a fairly large team involved in the process. Gawande shares an interesting example of the importance of a checklist. Well-known rock band Van Halen has an extensive list of requirements that covers key items such as the set-up of staging, sound equipment, lighting and security needs and nutritional requests for the band and crew when they are on tour. In the band’s contract with concert promoters, there was a specific clause: “no brown M&M’s”. They did this to ensure that the promoter read every single word in the contract. If the brown M&M’s appeared, the band did a complete audit of the full stage and sound setup to ensure everything was perfect. The idea was that if the tour venue was not careful in the “little things” — like ensuring there were “no brown M&M’s” — they couldn’t be trusted to be careful in key safety issues like proper heavy equipment installation. The devil is in the details. This is an example of a minor detail in a list of many, but it goes to show how important it is to follow a checklist, in this case a list of requirements. Once developed, checklists can always be refined. I find myself doing that regularly after every CLE event. Slight tweaks and improvements make for continued success in events. This was especially the case when I worked in delivery of licensing examinations. When I started, a checklist did not exist. I was overwhelmed with the specific details that needed to be looked after, and my solution was to create a checklist. In my mind, I walked through the process from start to finish. As I did that, I put each step down on paper and translated it to a checklist for pre-exam day, exam day and post-exam. After each exam cycle and before the beginning of the next, I would review the checklist and make the necessary changes. Gawande provides the reader with “A Checklist for Checklists,” that is, a guide to preparing checklists that work. He suggests three stages in the development of a checklist: development, drafting and validation. In the development stage, Gawande suggests adding items to the checklist that would improve communication among team members, something I would have never thought of, but a definite “best practice” tip. Another question he asks is, “were all members of the team involved in the checklist creation process?” There is no doubt that when several people are involved in a project, the checklist will affect them and their processes, so they should be consulted. 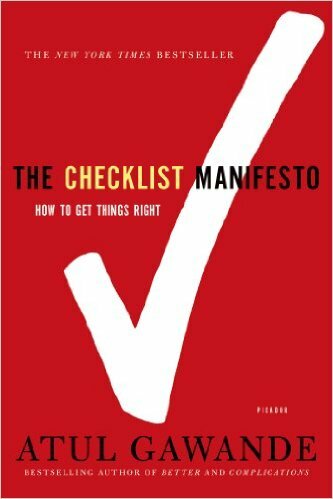 Gawande recommends that checklists be short, fit on one page, and have a title that reflects the objectives. He suggests that the checklist be tested with the people involved — in either a real or simulated situation — to make necessary adjustments to ensure the checklist works. He also suggests that once the checklist is put into action, it gets reviewed every so often to ensure it’s kept up to date and relevant. The author reports that research has found that, without a checklist, the chance for error was higher. With a proper checklist in place, the chance for error decreased. In CLE, whether we plan or deliver programs, checklists work. With a checklist in place, there is less chance for mistakes and missed deadlines. As good as I have been with creating and using checklists, I am looking forward to additional best practices from Larry Center, Georgetown Law Centre CLE, Donita Douglas, InReach and Paul Unger, Affinity Consulting Group in the “Be a Checklist Ninja!” workshop at the Annual Conference in Seattle.